Pacific Debt Inc is an accredited debt settlement service with years of industry experience and a reputation for helping clients settle millions of dollars of debt each month. To date, they have settled over $200 million in consumer debt. Since 2002, Pacific Debt Inc has provided debt settlement services to assist consumers in getting rid of unsecured debt. Unsecured debt is debt that is not backed by collateral and includes debt such as credit cards, personal loans, medical bills, and accounts already in collections. Pacific Debt Inc takes your unsecured debt and negotiates with your creditors to reduce the total amount you owe. All you have to do is make a monthly payment within your budget to build up a lump sum of cash that eventually pays off your creditors. When you first contact Pacific Debt, you will speak to a debt specialist to figure out if debt settlement is the best path for you or if there are other options that better suit your financial goals. Pacific Debt does a soft credit check (which does not damage your credit score) to see how much you owe to your creditors. Make sure to collect all the information on your finances and monthly budget before calling Pacific Debt. To qualify for Pacific Debt's settlement program, you need a minimum of $8,000 of debt and at least $500 in each enrolled account. If you don't meet these requirements, Pacific Debt will recommend one of their credit counseling programs. If you enroll with Pacific Debt, you will be informed by your debt specialist that you must stop paying your creditors, which will negatively impact your credit score. During this time you begin making a monthly contribution to a secure trust set up by Pacific Debt, which will eventually pay off your debt in one large payment. Your personal representative will keep in touch with you as the negotiations proceed and you will have 24/7 access to an online dashboard where you can monitor your accounts. Pacific Debt is currently available in 32 states. Experienced debt settlement company: Pacific Debt has 16+ years of experience under their belt and has been active in settling their clients' debt since 2002. Major industry accreditations: Pacific Debt is an IAPDA, AFCC, and USOBA accredited service, meaning that their debt specialists must undergo extensive training to speak with clients and they are audited annually to make sure they keep industry standards. Money-back guarantee: Pacific Debt services are covered by a money-back guarantee. 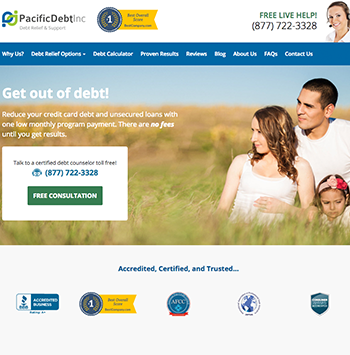 Pacific Debt's services are currently not available in much of the nation. At this time, they do not operate in Colorado, Connecticut, Delaware, Georgia, Illinois, Kansas, Louisiana, Maine, Mississippi, Nevada, New Hampshire, New Jersey, North Dakota, Ohio, Oregon, Rhode Island, South Carolina, Tennessee, Vermont, Washinton, West Virginia, and Wyoming. Although debt settlement will not hurt your credit score as much as filing a bankruptcy, it will negatively affect your score and be listed on your account for several years. This is true with all debt settlement companies and not only Pacific Debt. Pacific Debt Inc can reduce your debt by up to 50% before fees. Their debt settlement programs last from 2 to 4 years. Pacific Debt requires a minimum of $8,000 in unsecured debt, which is on the lower end of industry requirements. Each enrolled account must have a minimum of $500. The fee for debt reduction is 15% to 25% of the total debt enrolled. Pacific Debt follows industry standards and does not charge upfront or monthly fees. You are only charged if your debt is successfully negotiated. Pacific Debt offers a money-back guarantee. What is the minimum debt needed to enroll? The minimum debt needed to enroll is $8,000, with a minimum of $500 in each account. This is on the low end of the industry average for debt settlement. The fees for debt reduction are 15% to 25% and vary depending on your total enrolled debt and state of residence. There are no upfront fees and you only have to pay once you see results. Can Pacific Debt stop creditor harassment? Pacific Debt can't stop all creditor harassment, but they can work with you to help you reduce the number of calls. There are consumer protection laws that limit how often and what time a creditor can call you, along with what they are allowed to say. Pacific Debt's Client Care team will work with you to educate you on what they can do to reduce these calls. How long will the process of debt settlement take? Pacific Debt's goal is to get rid of your debt in 24 to 48 months, but this depends on your on the amount of enrolled debt and financial situation. What kinds of debt can be settled? You can enroll most kinds of unsecured debt, which is not backed by collateral. This includes credit cards, medical bills, personal loans, retail debt, collection accounts, and debt owed after repossession. Unsecured debts such as payday loans, legal judgment, consumer finance loans, and medical debt that is not in collections may not qualify for the program. How do I begin my debt settlement process with Pacific Debt? You can call Pacific Debt for a free phone consultation and speak with an expert to determine if their services are right for you. Pacific Debt can settle unsecured debts, which is debt that is not backed by collateral. This includes credit cards, medical bills, personal loans, retail debt, accounts in collections, and debt owed after repossession. Some unsecured debt like payday loans, medical debts not in collections, legal judgments, and consumer finance loans may not qualify. When you settle your debt, you must stop all payments to your creditors, which will result in a drop in your credit score. If you are already late on some payments, the change in your score may not be as high; however, if you choose to enroll, all your accounts will be listed as delinquent until Pacific Debt is able to settle your debts. Even though your credit score will be affected, your financial situation should improve by the end of the program.